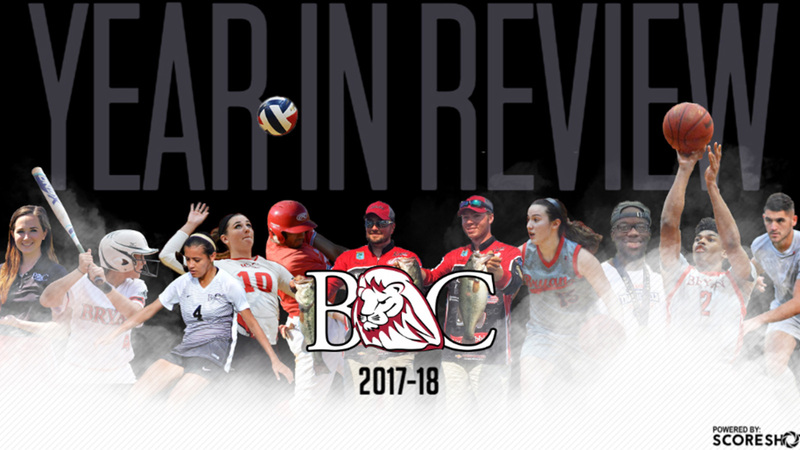 Dayton, Tenn. – With another year of Lion athletics behind us, it’s time to take a look back at some of the top highlights from the 2017-18 sports season. 5 Daktronics-NAIA Scholar-Athletes (Tucker Cain, Kurt Meeberg, Timothy Hostetler, Caleb Perez, & Cullen Royston). Most successful regular-season in program history (38-13 overall, 21-6 in conference play), capturing their first-ever AAC Regular-Season Championship. Fought for a No. 9 ranking in the final NAIA Coaches’ Top-25 Poll, the highest the Lions have ever received. Bryan ended 14th in the NAIA Baseball Coaches’ Postseason Top-25 poll. Received an at-large berth to the 2018 Baseball National Championship Opening Round – Williamsburg Bracket (Ky.). 47-8 overall record, tying for the 2nd-most wins in a season in program history. Program records broken – Fernando Garcia’s .439 batting average ties him with the previous program record holder for the top batting average in a season. His .732 slugging percentage is 4th Wade Weinburger is the runs scored leader with 75 and an overage of 1.29. Garcia is 3rd with 70 runs scored, averaging 1.21 per game. 100 hits and 1.72 hits per game average, Garcia shattered the previous best in the Lion’s record books, which was only set last year at 86. Weinburger’s 74 RBI’s is a new best, followed by Garcia in 2nd at 72. Garcia compiled 27 doubles and a .47 double per game average, becoming the Lion’s new total doubles leader. Garcia’s on-base percentage of .498 is top-5 in program history. Stephen Chamblee’s 102.1 innings pitched is the 4th-most by any Lion in history. Chamblee totaled 131 strikeouts with 11.52 strikeouts per game average, becoming the new Bryan strikeouts leader. He finished 2ndplace in total wins in the record books at 11-1 overall. 22 homeruns by Weinburger is a new best for the program. TSWA Player/Pitcher of the Week – Wade Weinburger, David Scoggins, Fernando Garcia, and Stephen Chamblee. AAC Player/Pitcher of the Week – Fernando Garcia (3), Stephen Chamblee (2), David Scoggins (1), Wade Weinburger (1), & Brandon Marklund (1). All-AAC 1st Team – Lake Burris, Stephen Chamblee, Fernando Garcia, Brandon Marklund, David Scoggins, Wade Weinburger, and Cody Young. All-Academic Team – Nicholas Bennett, Tucker Cain, Irvin Cespedes, Jacob Dublin, Josh Hinken, Jonathan Hostetler, Timothy Hostetler, Brandon Marklund, Kurt Meeberg, Caleb Perez, and Cullen Royston. First-year Head Coach Mark Ritchhart helped guide Bryan to a 9th-place finish in the AAC regular-season standings with a 12-31 overall record and 9-14 conference record. The Lions improved overall at the plate with one of the most difficult schedules in the country. The Lions had six bouts with top-10 teams and another eight in the top-25. Bryan lifted their batting average, slugging percentage, and on-base percentage compared to last year’s numbers. AAC Champions of Character Team – Lindsey Dunn. AAC All-Academic Team – Leslie Beecham, Kayla Hayes, Olivia Johnson, Sydney Olander, Madison Owens, Courtney Petty, Heidi Smith, and Cheyenne Wilson. AAC Champions of Character Team – Bryce Pickens. AAC All-Academic Team – Andres Arteaga, Kaden Davis, and Nick Scully. Lucas Coffelt had a top-20 finish in the NAIA Direct Qualifier. The Lions placed 9th in the AAC Spring Championship and 6th at the AAC Fall Championship. Kevin Knudsen had the lowest round score at the Harrison Bear Trace Invitational, earning him All-Tournament honors. Program’s first-ever NAIA All-American – Krista Reinhardt (Third Team). Reinhardt put her name in the Bryan College golf record books for the first time of the year – becoming the program’s first-ever AAC Player of the Year. All-AAC First Team – Krista Reinhardt. Krista finished 2nd in the Direct Qualifier – AAC Tournament. AAC All-Academic Team – Krista Reinhardt, Emily Hutson, Christina Lee, and Harley Schronce. AAC Spring Championship – Krista played the best round of golf, capturing the first AAC Women’s Individual Championship for the Lions since 2012. Her two-day total of 147 not only established her own 36-hole record but shattered a Bryan record that she owned, while also setting a new AAC record for the lowest 36-hole score in conference tournament history. AAC Women’s Golfer of the Week – Krista Reinhardt. Krista Reinhardt placed 2nd overall at the Point University Invitational. Krista Reinhardt placed top-5 at the Golden Tigers Invitational, followed by teammate Taylor Williams with a top-15 finish. Bryan shot a team score of 313 in the fall at the Maryville Invitational, shattering their previous school record for a team score, while Reinhardt individually placed 2nd in the tournament. NAIA Outdoor Track & Field Championships – James Eliezer put his name in the Lion’s T&F record book, running the 400-meter with a time of 47.23 seconds to become the 8th-fastest 400-meter sprinter in the country, securing him the All-American title. Not only did Eliezer become Bryan’s first-ever 400-meter All-American but also the program’s first-ever sprinter to capture the All-American honor. Eliezer’s time set a new program record in the 400-meter event. Eliezer placed 4th overall in the AAC Outdoor Track & Field Championships. Michael Briggs placed 2nd in the 600-meter with a time of 1:25:82 during the AAC Indoor Track & Field Championships, earning him All-AAC honors. AAC Champion’s of Character Team for Women’s Cross Country – Elizabeth Thompson. AAC All-Academic Team – Xia Grimwood. Brady Smith notched a top-25 finish in the 8k at the Men’s Cross Country AAC Championship… the team placed 8th. AAC Champions of Character Team for Men’s Cross Country – Brady Smith. AAC All-Academic Team – Brady Smith, Lance Moore, and Blake Revlett. EJ Bush was named the AAC’s Freshman of the Year, was Bryan’s lone representative to the All-AAC 2nd Team, All-Freshman Team, and All-Defensive Team. The Lions finished 17-12 overall with a conference record of 11-9, good enough for 3rd in the AAC regular-season standings. AAC Champion’s of Character Team – Reagan Johnson. AAC All-Academic Team – Reagan Johnson, Riley Dempsey, and Jonathan Hostetler. Daktronics-NAIA Scholar-Athletes – Marlee Sells, Tonesha Allison, and Amber Levi. The Lions had a historic season, ending in the opening round of the 2018 NAIA Div. II Women’s Basketball National Championship. Bryan finished the year 25-10 overall and a notable 19-5 in AAC play. The Lions are AAC Regular-Season Champions and defended their 2017 AAC Tournament title by becoming back-to-back conference tournament champions. Bryan ended with a No. 23 ranking in the final NAIA Coaches’ Top-25 poll. The Lions were one of the most explosive offensive teams in the country, ranking them in the top-10 in three-point percentage (0.391), total three-pointers made (344), and three-pointers made per game (10.118). Their total scoring offense is 10th-best in the country (2,616 points). Their scoring margin at 13.794 is 16th-best, and their 76.941 points per game is the 19th-best scoring offense per game. New program records were set this year: Karli Combs – best three-point percentage for season (45.3%) and best free throw percentage in season (96.6%). Season records for the team include average three-pointers made per game (10), three-point percentage (38.8%), three-point attempts (902), three-pointers made (350), and field goal attempts (2,194). 2nd-straight year the Lions have competed in the Women’s Basketball National Championship (eventually fell to the 9th-ranked team in the final coaches’ poll, Indiana Institute of Technology). AAC Tournament MVP – Amber Levi. AAC Tournament Team – Amber Levi, Deandra Luna, and Karli Combs. AAC Freshman of the Year – Karli Combs. All-AAC 1st Team – Karli Combs, Amber Levi, and Deandra Luna. All-Freshman Team – Karli Combs, Deandra Luna, and Shayla Ludy. All-Defensive Team – Tonesha Allison. AAC Champions of Character Team – Tonesha Allison. All-Academic Team – Tonesha Allison, Amber Levi, Keneisha Love, Tristan McClellan, and Marlee Sells. Other highlights include wins over a ranked opponent and two others who received votes and also a perfect month of January where the Lions went 9-0. AAC Player of the Week – Amber Levi & Deandra Luna. Daktronics-NAIA Scholar-Athletes – Katelin Scoggins, Veronica Salas, Micayla Keen, and Mariah Dunlop. Bryan battled for an overall record of 6-22 and AAC record of 5-12, finishing No. 5 in the North Division conference standings. All-AAC 2nd Team – Hope Burnett. All-Freshman Team – Rheagan Kean. AAC Champion’s of Character Team – Mariah Dunlop. AAC All-Academic Team – Mariah Dunlop, Emalie Hicks, Jennifer Keck, Megan Martinez, Kristen Parrish, Veronica Salas, and Katelin Scoggins. Former Lion goes pro – Jordan Dunstan began his professional debut as a member of the Nashville Soccer Club. NAIA All-American – Charlie Clarke (Honorable Mention). Bryan pieced together a remarkable season, battling for an impressive 14-6 overall record and 8-1 conference record while downing three ranked opponents and one receiving votes. The Lions closed out the year reaching the semifinal round of the AAC tournament and receiving a No. 25 ranking in the final NAIA Coaches’ Top-25 poll. CoSIDA Academic All-America® 2nd team for second straight year – Stephen Ricketts. CoSIDA Academic All-District® 1st Team for second straight year – Stephen Ricketts. Daktronics-NAIA Scholar-Athletes – Stephen Ricketts, Kevin Roenpage, Keith Lyons, Marcelo Monteiro, Jason Ward, Isaac Hendrix, Timothy Hostetler, and Jonathan Montoya. AAC Offensive Player of the Year & Golden Boot – Charlie Clarke. AAC Defensive Player of the Year – Stephen Ricketts. All-AAC 1st Team – Charlie Clarke, Stephen Ricketts, Dino Jones, Brad Spooner, Kevin Roenpage, and Jason Ward. All-AAC 2nd Team – Alex Horton & Jonathan Ricketts. AAC Champion’s of Character Team – Stephen Ricketts. AAC All-Academic Team – Keith Lyons, Marcelo Monteiro, Jake Poulakis, Jonathan Ricketts, Stephen Ricketts, Kevin Roenpage, Daniel Vonthin, and Jason Ward. NAIA National Offensive Player of the Week – Charlie Clarke (first time in program history). NAIA National Defensive Player of the Week – Stephen Ricketts. AAC Offensive Player of the Week – Charlie Clarke (3 times). AAC Defensive Player of the Week – Dino Jones, Alex Horton, and Stephen Ricketts. TSWA Player of the Week – Brad Spooner & Charlie Clarke (2 times). NAIA All-American – Ruth Rosales (Honorable Mention), becoming the first-ever Lady Lion in recorded program history to earn All-American honors. Bryan registered an overall record of 12-7 and AAC record of 9-2 en route to the winningest season in program history and the program’s first-ever AAC Regular-Season crown. The Lion’s season was ended in the program’s first-ever trip to the *NAIA Women’s Soccer National Championship Opening Round (fourth national tournament appearance), where they made sure the opposition knew they could compete with the best. The Lions forced the No. 1 team in the nation, Martin Methodist College (Tenn.), into overtime before the RedHawks narrowly escaped via golden goal 1-0. Not to mention, the RedHawks led the country in scoring. Daktronics-NAIA Scholar-Athletes – Hannah Bohner and Morgana Hardt da Silva. AAC Coach of the Year – Paul Babba. AAC Offensive Player of the Year – Ruth Rosales. AAC Defensive Player of the Year – Morgana Hardt da Silva. AAC Freshman of the Year – Makena Giles. All-AAC 1st Team – Makena Giles, Morgana Hardt da Silva, Polly Holt, and Ruth Rosales. All-AAC 2nd Team – Paige Klose and Johanna Rappe. AAC Champion’s of Character Team – Hannah Bohner. AAC All-Academic Team – Mary Mai Berchtold, Hannah Bohner, Morgana Hardt da Silva, Keeley Holliday, Polly Holt, and Paige Klose. AAC Offensive Player of the Week – Makena Giles & Ana Ramirez. AAC Defensive Player of the Week – Polly Holt & Morgana Hardt da Silva. The Lions received votes in the final Women’s Soccer Coaches’ Top-25 poll, marking the first time since Sept. 21, 2010 that Bryan has received votes. Top-10 finish in the running for Cabela’s School of the Year, recognizing them as one of the best in the entire country. 2nd-place finish in the BoatUS Collegiate Bass Fishing Championship presented by Cabela’s (Nathan Bell & Cole Sands). In the month of May… the dynamic duo of Bell & Sands won the Chickamauga Tournament, finished 4th of 263 boats at Cherokee, and was runner-up in the Cabela’s Championship. Three boats had a top-20 finish on Cherokee (Bell & Sands – 4th place, Johnathan Peck & Griffin Heffington – 7th place, and Thad Simerly & Ethan Shaw – 19th place). 2nd-straight year that Bryan has won on Chickamauga – both times Sands has been a part of the winning boat. Bryan had three boats qualify and fish in the YETI FLW College Fishing National Championship, four boats take part in the Cabela’s BoatUS Collegiate Bass Fishing Championship, and still have the Bassmaster National Championship in Tahlequah, Oklahoma that will take place in July (6 boats – Fishing will be Jake Lee and Jacob Foutz, Thad Simerly and Ethan Shaw, “Fogg Brothers” Connor and Chandler, Nathan Bell and Cole Sands, Johnathan Peck and Griffin Heffington, and Dalton Price). Despite only having one win this season, the Lions have consistently finished towards the top of most of the events… 22-of-248 on Toledo Bend, 14-of-188 on Seminole, 53-of-208 on Sam Rayburn, 13-of-273 on Guntersville, 36-of-216 on Kentucky Lake, 17-of-479 again on Kentucky Lake, and 23-of-266 on Pickwick.